Welcome to Geneva on this beautiful sunny day! This is the first time we have met in Geneva since 2012, with a joint Animals and Plants Committee meeting being held in Dublin, Ireland, and meetings of this Committee being held in Veracruz, Mexico and Tel Aviv, Israel since that time. We are most grateful to the Government of Switzerland for making this venue available to us, where we have 10 days of meetings ahead of us for both scientific committees and one joint meeting. Having lived there a few years now, I doubt this sunny weather will hold out but I am sure the welcome will be warm throughout. This is our first meeting since CITES CoP17. CoP17 was our biggest and most successful CoP, with the largest ever agenda, number of attendees and number of side events. We had over 3,500 people attend the CoP, where 38 new or revised Resolutions and 352 new decisions were adopted, and over 500 species were added to the CITES Appendices. The enthusiasm and interest in CITES reflected at CoP17 has carried over to our Animals and Plants Committees. We have 296 registered participants for this Committee, which is the largest number ever, in fact being the first time we have had over 200 participants. This week we will have over 500 people participate in the meetings of both scientific committees and the joint committee meeting. We have a rich agenda but before touching upon it I would like to refer to some changes in the Committees and Secretariat since CoP17. We have new Chairs of all three CITES committees - the Animals, Plants and Standing Committees but we have retained our gender ratio of two women and one man. Firstly, we would like to warmly welcome Mathias Loertscher as new Chair of the Animals Committee. Mathias knows CITES inside and out. He has deep experience of our global processes, our CoPs and all three committees, as well as a deep knowledge of national implementation through his work here in Switzerland. We are most fortunate to have Mathias as our Chair to guide us through to CoP18 and beyond. We also warmly welcome new Committee members from Africa and Asia and Alternate Members from Africa, Latin America, Europe and Oceania, and our new Nomenclature Specialist, Peter-Paul van Dijk. I would also like to acknowledge Carolina Caceres as Chair of this Committee from 2014-2016. She has not however escaped from us yet, and is now serving as Chair of our Standing Committee. A big welcome also to all Committee Members and Alternates, Party observers, and intergovernmental and non governmental observers. Karen GAYNOR as Scientific Support Officer - Fauna. Baran Aziz YILMAZ as Aquatic Species Support Officer on secondment from Turkey for one year. Lauren LOPES as Scientific Support Assistant (Intern). Eleonora PALMERO as Documents Clerk (Consultant), replacing Elena KWITSINSKAIA for this meeting. Elena has taken up a higher level position with another UN body - she did a great job for us and we thank her for everything she did for CITES. Amy REID as Information and Meeting Assistant (Consultant). Jina CHOI as Medicinal Plants Researcher (Consultant), and former South Korean intern. Daniel KACHELRIESS as our first Marine Species Officer (JPO), with thanks to Germany - and we will also be getting another JPO courtesy of Germany on Medicinal Plants. I would also like to advise that Milena SOSA SCHMIDT Coordinator, will for the next four years as CITES Trees and African Elephant Fund project officer, and we will be calling her as Scientific Support Officer - Flora post shortly. We also welcome Sofie FLENSBORG as our new Legal Officer and Esther KANG as Conference clerk, an intern provided by South Korea. This Committee does extraordinary and critical work, with members serving in an individual capacity and we thank you for giving CITES the benefit of your time and expertise. You bring sound science to our decisions makers, in support of well informed decisions noting the supreme decision making role of the Parties through the CoP and Standing Committee. You are also charged with managing the Review of Significant Trade (RST) process, which is a unique and critical compliance mechanism to help Parties ensure trade in Appendix II listed species is sustainable. This RST process was revised at CoP17 to make it more timely, transparent and simple and these new instructions are now with you to implement. CoP17 also established a new and very important process on reviewing trade in specimens reported as being produced in captivity or ranched. This work is already underway as you will have read and your inputs to this process are extremely important. Many other matters are before you affecting iconic CITES listed species as requested by CoP17 - and this direct link between your work and the CoP is a defining feature of our committees work. There are two general clusters of work affecting aquatic and terrestrial species. What stands out is perhaps the number of items on aquatic species, especially marine species. This reflects the Parties growing interest in bringing more marine species under CITES, as we have seen the past two CoP cycles. You have before you many Agenda items affecting eels, corals, sharks, rays, queen conch, Bangaai cardinal fish, sturgeon, freshwater rays and many more. The terrestrial side of the agenda is perhaps dominated by snakes, but there are important Agenda items on lions, leopards, cheetahs, and wild dogs. the use of new and emerging technologies. The CITES Strategic Vision after 2020, which will need to be adopted at CoP18 in 2019. 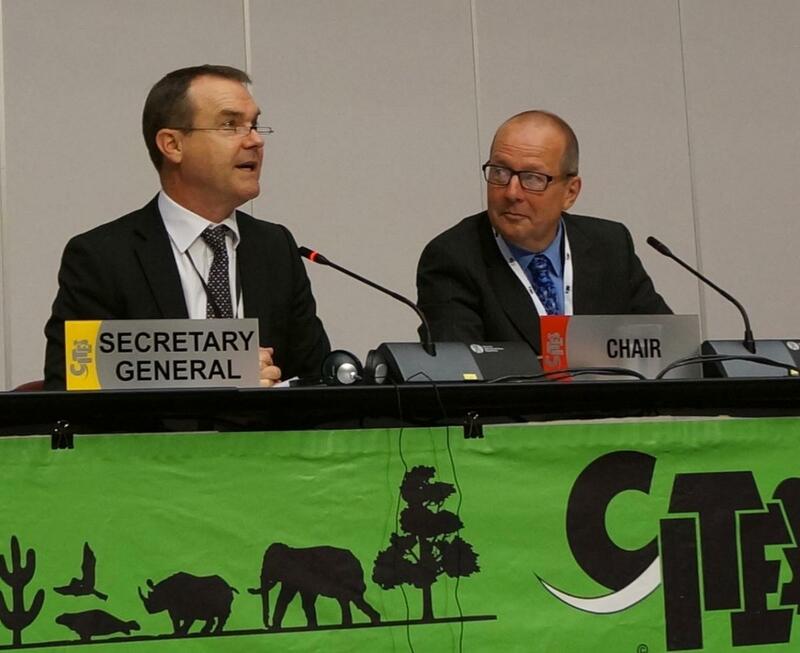 It is an exciting time for CITES as the world makes best use of this remarkable instrument and our collective success is inextricably linked to the work of this Committee, and in fact all three of our Committees. I would like to thank our small but very good Secretariat team for its efforts in preparing for this meeting, especially David as Chief of Governing Bodies and Meeting Services and Tom and Chief of Scientific Support Services. We all work as one wider Secretariat team in preparing for and delivering on these meetings and thanks to all concerned. Thank you to all Committee members and Alternates for volunteering your time and expertise to CITES and to our new Chair Mathias for his commitment and support. With that please join with me in welcoming Mathias as Chair of the Animals Committee and in inviting him to make his first introductory remarks.